Last week, I ran Maisons France Confort through my checklist and found it quite interesting. The 10 years from 2002-2011 is a full cycle with boom and bust years, so achieving on average an ROE of 28% with a financially unlevered balance sheet is outstanding. Running a business with only ~9% of “operating” net assets compared to sales is something you don’t see very often. Interestingly, Kaufman & Broad improved their capital management as well but they still need 3 times the operating net assets to generate roughly the same returns. Despite a significant leverage, ROE are lower on average and due to the leverage much more volatile. Maybe this is one of the reasons why Maisons has outperformed larger Kaufman by a wide margin over the last 10 years. Interestingly, the operate roughly at the level at Kaufmann & Broad but nowhere near MFC’s level. Helma by the way actually seems to have jumped into property developement which might explain the increase in operating assets. So compared to two other homebuilders, the business model of Maisons France looks extremely “lean” from a capital management point of view. The big question of course is why are they so much better ? Unlike many other markets, in France there is virtually no development risk for the company because land is purchased separately by the customer and the house will only be built once it is fully financed. Under Note 4.8 (receivables) we find the interesting information, that the receivables amount on their balance sheet is a net amount. So the roughly 80 mn receivables translate into 320 mn gross receivables against which they show something like 250 mn prepayments. Those prepayments, which they seem able to get are basically an interest free float which explains in my opinion the superior ROE and ROIC metrics compared to the other builders. From a pure capital management perspective, Maisons France Confort seems to have a very good business model. they seem to generate a lot of interest rate free “float” which greatly reduces the required amount of net operating assets. I am not sure if currently is the right time to invest as the stock has run up quite fast and french housing might be slow this year, but is definitely a very interesting company. The big quesiton is: Is such a business sustainable without an obvious “moat” ? In my opinon yes, because creating such a business model is not something you can do from scratch. 3-5% margins are not overly attractive for many competitors. Howevr, in any case some deeper research into to this will be necessary anyway before a final investment. Is France like Germany 10-15 years ago ? The weekend is always a good time to step away from the “micro level” i.e. single stocks to more general considerations. More recently, if find myself more and more analysing French stockss, as they seem to be technically still quite cheap. In my portfolio, the weight of my French stocks Bouygues, Tonnelerie, Installux, April, Poujoulat is around 15% and growing. On the other hand if you read especially “Anglo Saxon” media, it seems to be clear that France is in deep trouble. Perma Bear Mish for instance a month ago saw problems everywhere and as always a quite immediate chance of collapse. Germany, in contrast, is considered to be the growth engine of Europe despite a recent slow down. In the year 2000, Ireland was the Celtic Tiger as reflected in this famous speech of Mary Harney and a year before that, again the Economist branded germany as the “sick man of Europe”. But it is now coming under pressure as never before. As economic growth stalls yet again, the country is being branded the sick man (or even the Japan) of Europe. The red-green coalition government led by Gerhard Schröder since last October has “encouraged the suspicions of a corporate sector predisposed to fear the worst,” says Alison Cottrell, chief international economist at PaineWebber in London. The dark picture painted by Hans Eichel, Mr Lafontaine’s replacement, to justify fiscal belt-tightening has further unsettled industrial bosses. And a lack of corporate confidence has been one of the main factors that has kept unemployment so high. It is, perhaps, not surprising that market-friendly politicians, including one or two in the government, now complain of Germany being a blockierte Gesellschaft (blocked society). Unblocking it will take determination. Without that, Germany is unlikely soon to shed its title as the sick man of Europe. So what happened in between, how did the sick man of Europe become the (temporary) growth engine ? It is interesting to see that the biggest drop in corporate tax rates actually happened in the 1998-2005 period where Gerhard Schroeder led a Social Democratic/Green government. – increased labour flexibility (“Kurzarbeit”, etc. – privatisation of major Government companies such as Deutsche Post, Deutsche Telekom etc. The end of the “Deutschland AG” which was the description for the fact that almost all German companies were owned locally and/or by each other. Management of German companies did not have a lot of pressure because each manager sat on the board of several other companies. In the center of The Deutschland AG were the big financial institutions such as Deutsch Bank, Muenchener Rück, Commerzbank and Allianz. – finally the Euro. Before the Euro, German Insurers for instance had to invest 95% of their investments in Deutschmark. So basically if they had to invest in German shares because there was no alternative. After that, the 5% restriction changed to “non Euro”, so suddenly german insurers could diversify their portfolios into the Eurozone. Although there will always be a special relationship between companies in one country, one can say that the old “Deutschland AG” does not exist any more. One of the big examples for instance was the take over of Hochtief, the German construction company by ACS from Spain. 15 years ago, something like this would never had happened. Deutsch Bank or someone else would have organized a defense. In my opinion, the end of the Deutschland AG contributed a lot to the positive developement of big German companies like BASF etc. because it put a lot more pressure on management. Ironically as a result, many of the benefits of the German renaissance went to foreign shareholders. Without being an expert in French politics, however from my outside view this looks like a brilliant political move from Hollande. He gives his leftwing voters something directly and spectacular to calm them down. I would assume that a guy like Bernard arnault is not paying that much taxes in France anyway, so it doesn’t really hurt seeing him leaving. On the other hand, Hollande seems to now the German play book quite well and is on the way trying to improve labour flexibility in France. Interestingly, Sarkozy made a similar last minute attempt almost exactly a year ago. Still, this is no Reagan (or even Schröder) Revolution. The unions will preserve counterproductive worker protections and welfare guarantees. The deal includes expanded privileges for union reps within companies and more reserved seats on company boards. However, you have to start somewhere and together with his “U turn” in corporate taxation, this is a significant green shoot in my humble opinion. 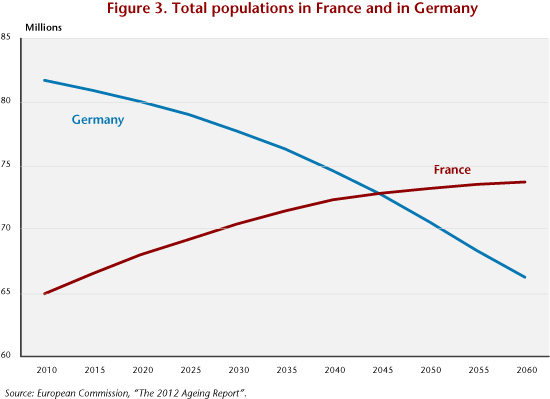 France’s demographic development is much much better than Germany’s as one can read for instance here. So yes, France has definitely a problem with youth unemployment, but part of the problem is that they actually do have a lot of young people which Germany does not have any more. I am not able to comment on Mali or any other political issue here. But if at some point in time Africa will catch up with the rest of the world, French companies will benefit most due to their historical relationship etc. It is clear that France at the moment does not look like the future growth machine of Europe but neither was germany end of the 90ties. However I see a good chance that France finally gets it act together and implements the required reforms. If that happens, France could experience a somehow similar trajectory like germany over the last 10-15 years. From an investment point of view, this might be one of the most interesting “secular” opportunities going forward despite (or because of) the very negative headline news. From a micro level, I find a lot more well managed, unlevered companies in France than in all the PIIGS countires combined. From a portfolio point of view, I will accept a quite significant weighting of French stocks if I find additional interesting french companies. I could imagine having up to 30-50% of french stocks in my portfolio going forward. But make no mistake, this will be a long journey and superior investment returns on French stocks might require more then 1 or 2 years to materialise. Hess AG (DEDE000A0N3EJ6) busted German IPO stock – Could the fraud have been easily detected ? Just yesterday, Hess AG, a company which IPOed on the German stock exchange on October 25th 2012, announced that they fired both, their CEO and CFO because of alleged balance sheet manipulations. In some follow up news, the company reported that sales might have been inflated and the financial position might not be as good as stated in the IPO prospectus. As a value investor, one wouldn’t invest in IPOs anyway. The Hess AG IPO was priced at levels which one could only assume as “optimistic”, with a trailing P/E ratio of ~50. The price was justified with the supposed “growth” the company was showing in the past and the “story” of the “LED” based business model. As usual, all parties involved in the IPO (Banks: Landesbank BaWü, Kempen, MM Warburg) will claim that they knew nothing and that you cannot protect against fraudulent management. Bilanzierungs- und Bewertungsmethoden der Gesellschaft sowie der in den Pro-Forma-Erl¨auterungen dargestellten Pro-Forma-Annahmen. This says they explicitly didn’t check the underlying figures. The big question of course is: Were there any red flags in the presented numbers ? How do you “fake” sales anyway ? Well, this is quite simple. You have to organize some kind of “strawman” first, then sell the stuff to him/her and book the proceeds against receivebales. So whenever one sees a large increase in receivables, one should be extremely cautious. So it is pretty easy to see, that receivables compared to sales almost doubled over 2 years. The increase in receivables almost exactly mirrors the actual increase in sales. It looks like that almost all the sales increase were actually generated by sales against receivables. At first it looks that in total, operating CF over the last 3 1/2 years was positive and the company did just invest a lot. But how did they manage the Turnaround ? Der operative Cashflow erh¨ohte sich von TEUR -3.133 im ersten Halbjahr 2011 um TEUR 6.494 auf TEUR 3.361 im ersten Halbjahr 2012. Wesentliche den operativen Cashflow bestimmende Faktoren waren ein erheblicher Mittelzufluss aus der Position „Veränderungen der Forderungen aus Lieferungen und Leistungen und sonstigen Forderungen und Vermögenswerte’’ in Höhe von TEUR 8.130 gegenüber einem Mittelabfluss im ersten Halbjahr 2011 in Höhe von TEUR 638, der Rückgang des Mittelabflusses aus der Veränderung der Vorräte in Höhe von nur TEUR -652 gegen¨uber TEUR -3.043 im ersten Halbjahr 2011 sowie eine deutliche Erhöhung der Position Abschreibungen in Höhe von TEUR 2.086 gegen¨uber TEUR 1.255 im ersten Halbjahr 2011. Gegenl¨aufig verhielt sich die die Position „Veränderungen der Verbindlichkeiten aus Lieferungen und Leistungen und sonstiger Verbindlichkeiten’’, die zu einem deutlich erh¨ohten Mittelabfluss in Höhe von TEUR -7.976 im ersten Halbjahr 2012 gegen¨uber TEUR -1.719 im ersten Halbjahr 2011 f¨uhrte. This statement clearly shows that there is something very fishy going on. In the table I extracted above, we can clearly see that there was a NEGATIVE effect from receivables and inventories in the first half year and an unexplained very POSITIVE effect from payable. So why do they state the exact OPPOSITE in their explanation of the cash flow statement ? Explanation 2: They included other balance sheet item here in order to obscure the fact that they have inflated sales. We can clearly see that the 6m “flow” numbers have absolutely nothing to do with the delta of the respective balance sheet numbers. At that point in time one could already stop and conclude that there is either total incompetency or already fraud. Even taking into account all the other short term balance sheet figures, one never gets to the stated cash flow numbers. In my experience, strongly rising receivables combined with an incomprehensible or even wrong operating cashflow calculation are a very reliable “red flag”. Although it sounds like “Monday morning quarterbacking”, a relatively superficial analysis of HEss AG’s IPO prospectus would have discovered some serious issues with receivables and operating cash flows. Whe someone starts to doctor around with fake sales, one usually gets negative operating cashflows. If the cashflow statement then looks incomprehensible or wrong, actual fraud is quite likely. In cases like Hess, “red flags” in that magnitude could even be a very good indicator for an interesting short opportunity. In cases like Reply, where the inconsistencies are on a smaller scale, it is rather a hint to stay away from investing. Edit: If someone thinks that Hess is now a good investment, because it is so “cheap”, then forget it. Eevn if there is some “sound” business left in the company, first of all there is no proof that they ever earned money and secondly I will assume that there will be quite some legal action on that one. As it is commonly known, free lunches are few and rare in the stock market. Another proof for this was last week’s termination of the TNT Express takeover by UPS. I was quite lucky that I didn’t join in the “trade“, despite considering it quite seriously. My final decision was based on the believe that in such a “crowded” market like merger arbitrage, if a situation looks too good to be true, most likely it isn’t true. As discussed in the previous post, at the current level, TNT Express is still not cheap, for instance compared to FedEx. To me, this looks like that the offered price of 9,50 EUR was way too high and UPS realized this at some point in time and did not really try hard to get the deal through. For a company like UPS, blaming it to the EC is always a “face-saving” possibility. However that also means that the price tag of UPS might never be reached again, even if FedEx would show up as potential buyer. On the other hand, TNT Express might still benefit by being spun off from POstNL which is crippled by pension liabilities and the terminally declining mail business. This might have to do also with Moody’s recent downgrade. At the moment, both, PostNl and TNT Express are too much “hot potato” type investments, but it is definitely something for my “special situation” watch list. I think it will be especially interesting to see if TNT Express is able to turn around the business on a standalone basis. Alsi for the future, I think it is the safest to keep away from Merger Arbitrage situations for my special situation “bucket”, as this requires very special skills which I do not have. It seems that French activist investor Lutetia is trying to start a campaign for PostNL. This could bcaome interesting at some point. Lutetia also showed up (quite succesful so far) in the SIAS Spa case. Herbalife: John Hempton visits a Herbalife Nutrition club and some interesting comments from the “Waren Buffet for shorties”, Jim Chanos on “mulit level marketing” and Herbalife. Plus the full 30 minutes interview with Jim Chanos. Looking at other good investors is one of the simplest way to generate investment ideas. I had linked to Ennismore already, which is a very interesting European small cap manager. Maison France Confort (MFC) is a construction company that designs and builds family homes in France. Unlike many other markets, in France there is virtually no development risk for the company because land is purchased separately by the customer and the house will only be built once it is fully financed. MFC’s model is to provide a service designing the building and sub-contracting its construction. This ties up little capital and has allowed them to generate post-tax returns on net operating assets of 30% over the last 10 years. The company was founded by the Vandromme family five generations ago and they still own over 30%. It is run by brothers Philippe and Patrick Vandromme who have built MFC into the largest player in what remains a very fragmented market, with a 6.6% share of the self-build market in the regions that it operates in (4.0% for France as a whole). MFC has consistently taken share over the last 15 years through organic growth and acquisitions, a trend we expect to continue. MFC benefits from its greater scale: its large number of architects give it a more extensive range of houses (particularly energy efficient homes), it has a more professional and bigger sales force, a strong brand name, greater capabilities to deal with regulations and bargaining power with subcontractors and raw materials suppliers. As a result, revenue grew at a compound annual rate of 15% from 2000 to 2011, of which over half was organic, while the market for single homes was broadly flat in volume terms. MFC primarily serves the lower end of the market, particularly first time buyers, with the average house costing EUR 100,000 to build (excluding VAT). With general economic weakness in France, tighter lending conditions and uncertainty around the new government’s incentives for homebuyers, housing starts are down 14% year on year for the nine months to September 2012 and MFC’s order book is down a similar percentage on a like for like basis. However the cost base is highly flexible, we estimate around 90% is variable with demand, and this allowed the company to remain profitable even in very weak markets from 2007 to 2010 (we also like the fact that Philippe and Patrick waived their bonuses in each of these years). With net cash of EUR 59m (equivalent to a third of its EUR 174m market cap) MFC is in a good position to take advantage of the weak market and has a proven record of strong capital allocation, buying back shares at depressed levels and making small bolt-on acquisitions that typically have a 3-4 year payback. At the current share price of EUR 25.10 the historic dividend yield is more than 5% and MFC has an enterprise value that is 3.2 times its operating profit over the last year and only six times the trough profit achieved in 2009. This is far too low for a business that has consistently generated a high return on capital and we think the shares have at least 80% upside. 4 . Potential special circumstances like Euro crisis, very diverse business activities, complex structure, Spin off etc. 12. Large acquisitions in the past ? 13. Large share Intangible assets ? 14. Pension liabilities, operating lease ? 17. Treatment of shareholders in the past ? 18. Sharecount stable or decreasing ? 20. Insider Share purchases/sales last 12 months ? 22. 10 Years of history available ? 24. Positive/neutral price momentum ? 25. high quality investors as share holders ? 27. Potential short/medium catalyst ? 28. 10 year sales growth above inflation ? All in all, this results in a quite good score of 19 (out of 28), which compared to my other stocks looks quite good. So this is definitely a stock to follow up more closely. I am still considering if I might implement either a higher range (like -3 to +3) or decimals to further differentiate. Like for instance at the moment I would give a +1 score to an entity with 30% debt as well as to one with net cash etc. However I am not sure if this makes the “first step check” to complicated. Based on my checklist, Maison France Confort looks very interesting and definitely a stock to follow up. Cheap on many metrics combined with a very capital efficient business model makes it interesting. Only drawback is the focus on the currently dwindling domestic French housing market, where the portfolio is already exposed to via Poujoulat (chimneys), Installux and even Bouygues.